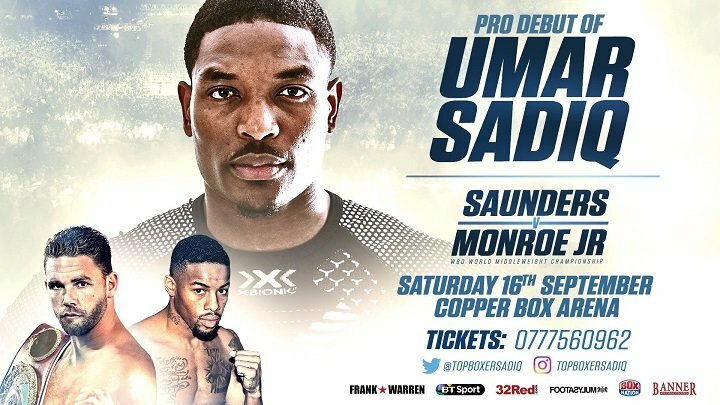 Super-Middleweight Umar Sadiq recently joined Frank Warren’s growing stable and is confident his career switch will pay dividends. In June, the Ilford man turned pro and is set to make his debut on the Billy Joe Saunders v Willie Monroe Jr undercard at the Copper Box Arena on September 16th. “Up until a few months ago I had a job as an accountant. I left that to focus fully on boxing,” Sadiq told Below the Belt TV. “That’s because I’m so serious about what I’m doing. There are so many things that I can draw on to back up my belief in being the best in the world. As an amateur, Sadiq boxed for England and Nigeria and only just missed out on representing the African nation at the Rio Olympics last summer. He also graduated in Accountancy at London Metropolitan University, but decided to give up a highly-paid job in the city to follow his boxing dream, and he believes he can win major titles. “When I’m in an accountant office, I’m working and I know what my limits are,” explained Sadiq. “I can see what my manager’s earning, I can see what the director’s earning. What the director’s earning is not enough for the lifestyle that I visualize for myself. Billy Joe Saunders makes the second defence of his WBO Middleweight World Title against American Willie Monroe Jr in the evening’s main event; Ilford Light-Heavy powerhouse Anthony Yarde fights for the Vacant WBO Inter-Continental Title; teenage Heavyweight sensation Daniel Dubois takes on AJ Carter for the Vacant Southern Area strap in only his fifth contest; knockout artist Joe Pigford fights for the Vacant WBO European Super-Welterweight title. Some of the very best up-and-coming prospects in the country including Welling Super-Featherweight Archie Sharp; Ilford Super-Bantamweight Lucien Reid; Fulham Super-Middleweight Zak Chelli, New Malden Super-Middleweight Lerrone Richards and Erith Flyweight Jake Pettit feature. Ilford Welterweight Hamza Sheeraz and Tamworth Light-Heavyweight Ryan Hatton their highly-anticipated pro debuts. Previous boxing news: Miguel Cotto-Antonio Margarito III: Would you watch it?